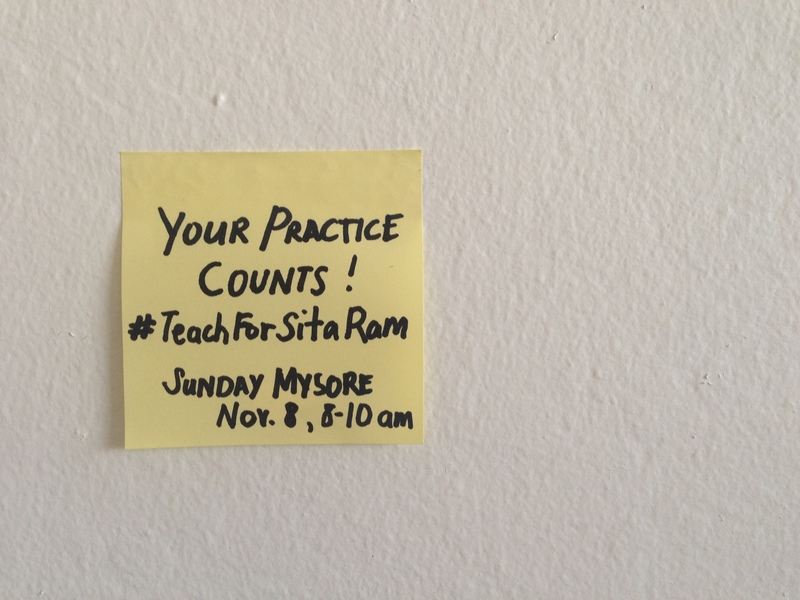 This Mysrore Sunday, I will be teaching class for the benefit of a young man from Mysore named Sita Ram who has suffered an unfortunate accident with an exploding mobile phone. He will never completely recover from his injuries, but money raised through this class will help him as he adapts to a new way of life. There are so many causes, so much tragedy in the world, you might ask, what makes this different or special? My answer is “not much,” suffering is pretty universal. We all have to roll with the punches and get on with it–that work, ultimately, it’s a solitary one, but it helps to know that we aren’t alone. Our yoga practice calls us to cultivate one-pointed attention, it asks us to stop being distracted, to draw our energy inwards. How many times has our drishti (point of focus) drifted, and somehow, sometimes by someone, we are reminded to mind our own business?! We so often look beyond because we’re so afraid of looking close. Over the last few months, I have been focused on self-love. Being one so used to giving energy away, this came with certain challenges. It is tough work reconciling that some things are meant for us and other things aren’t, it is harder to recognize that we are not just enough the way we are, but really ample and full. These days, I feel incredibly blessed and grateful. Having taken time to nourish myself, I feel my cup very, very full—and it is in such instances that it feels most right to share our energy and blessings with others who may be in greater need of love and attention. If you would like to join me, class is at 8-10am on Sunday. All with established ashtanga practices are welcome. You are welcome to make a donation even if you don’t make it to class. Contact me for details kaz.castillo@gmail.com. Thank you.